This model is being discontinued and ex-hire pools sold off. It is being replaced by the FlatPack Galilee and also by the ‘Ben’s Boat Baptistry made by woodenbaptistery.co.uk – remember to buy your equipment kit from us! The Galilee: quick to set up, a good size and plenty insulation, so it’s perfect if you’re hiring a space for your event. The Galilee is the preferred option for customers using a hired space. It’s fast and easy to put up, robust, insulated and still big enough to baptise a tall adult with attendants. You get the full reassurance that, in over a decade of regular use, we’ve never seen a leak thanks to the strong double liner. And, because of the great insulation, you may not need a heater at all, as long as you have access to hot mains water. You can choose a wooden cladding or fibreglass in a range of colours with blue as standard. Choose the colour of your double liners, with pale blue as standard. 6 panels; double liner; nuts and bolts; foam base mats; a submersible pump; 15m layflat hose; an insulating floating top; puncture repair kit. If purchasing, there is the option of 15m crushproof piping OR 20m layflat piping. This pool is available for hire only where the customer collects and returns to our warehouse. It is available as lease, sale or ex-hire sale. 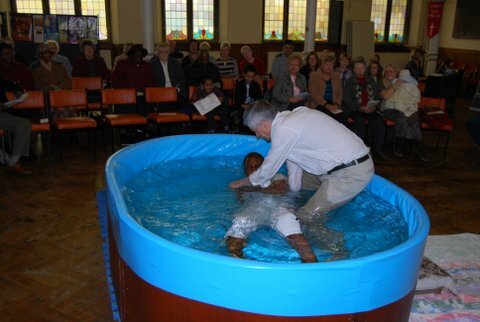 A video from Potters House, Wandsworth showing the Galilee baptistry in action. 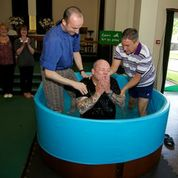 Galilee Baptistry, BaptistryUK from Baptistryuk on Vimeo.